As Cruise Director on Celebrity Equinox, Paul Baya is in charge of the entertainment presented aboard. You see him hosting the shows and events around the ship. In addition, you see him on stage in the Equinox Theater performing a duet with one of the singers in the production cast and as a lead singer fronting the band at the Rock the Ship deck party. All of this, however, is in addition to his managerial role programming Equinox's entertainment. The introduction of so many shows in such a short space of time is possible because “we have opened a big production studio, called the 'Studio, in affiliation with Florida International University. It is a massive 17 theater, rehearsal studio for Royal Caribbean and Celebrity.” The production casts will be able to use these facilities to learn and rehearse the new shows. And because there are multiple studios, several shows can be in rehearsal at once. Of course, not all of the shows in the Equinox Theater are production shows. Guest performers - - singers, comedians, acrobats, magicians - - also perform there. Celebrity's headquarters decides who will be performing on each of the ships. However, a ship's cruise director does have input into the decision-making. Talent alone is not enough to get a good recommendation. “A show here may not fare with a three or four day cruise on Carnival Line and vice versa.” Consequently, in making his assessments, Mr. Baya is mindful of Celebrity's style and of the type of people who sail on Celebrity. The acts have to be consistent with Celebrity's goal of providing a professional, “modern luxury” cruise experience and appeal to “the young 40, 50 and 60 year old couples who perhaps have two kids in college or who are just enjoying their baby boomer days” that travel on Celebrity. Managing the entertainment on Equinox is not just about the shows in the Equinox Theater. 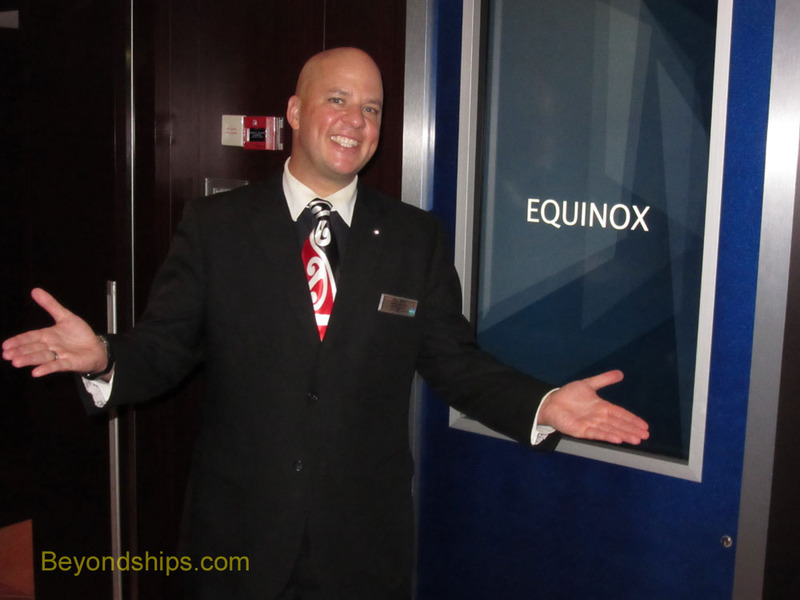 Equinox has several other entertainment venues and the cruise director has to decide how to use each of these venues. 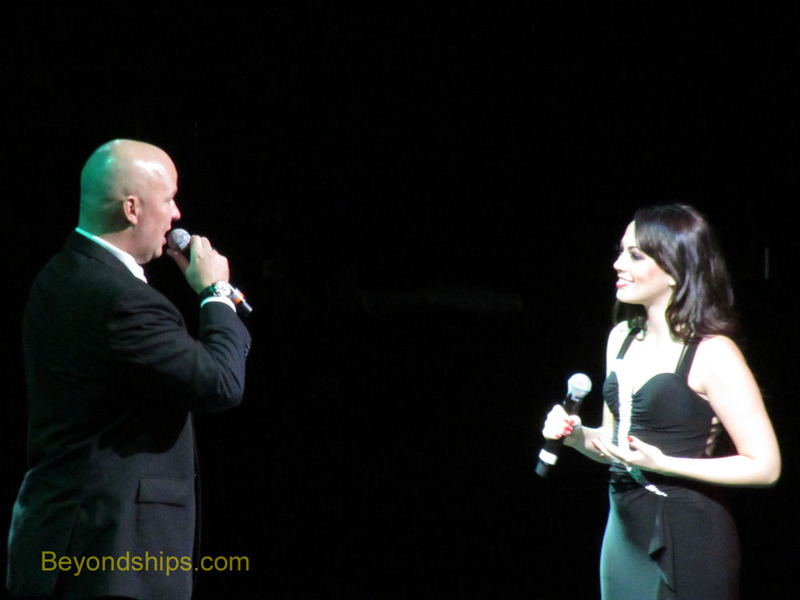 Above: Mr. Baya sings a duet with production cast vocalist Crystal in the Equinox Theater. 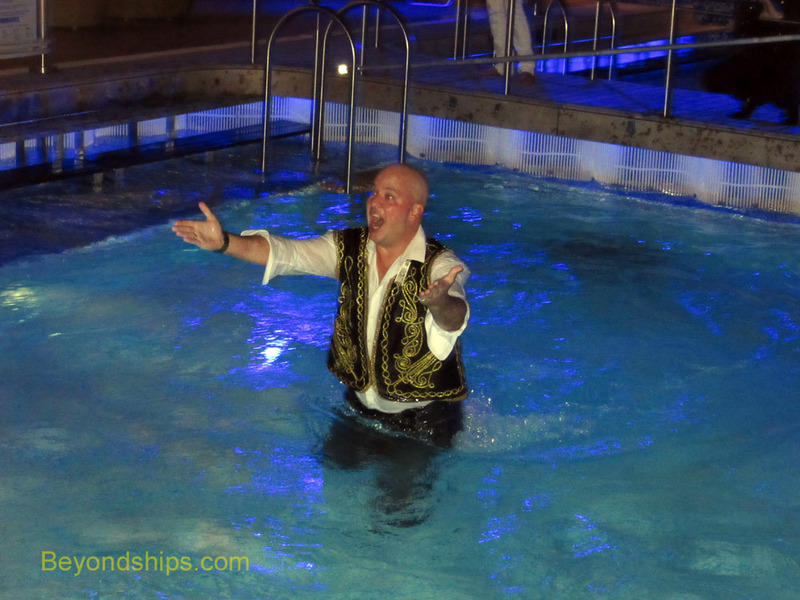 Below: A less formal moment - - the cruise director goes in the pool during the Rock the Ship deck party.